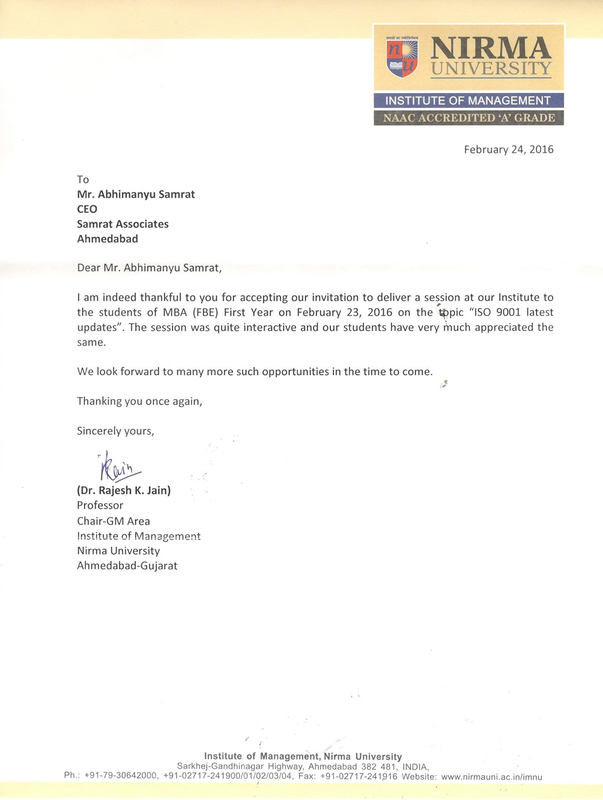 "Appreciation Letter provided by Institute of Management - Nirma University, I am indeed thankful to you for accepting our invitation to deliver a session at our Institute to the students of MBA (FBE) First year on February 23, 2016 on the topic “ISO 9001 Latest updates” . The session was quite interactive and our students have very much appreciated the same. 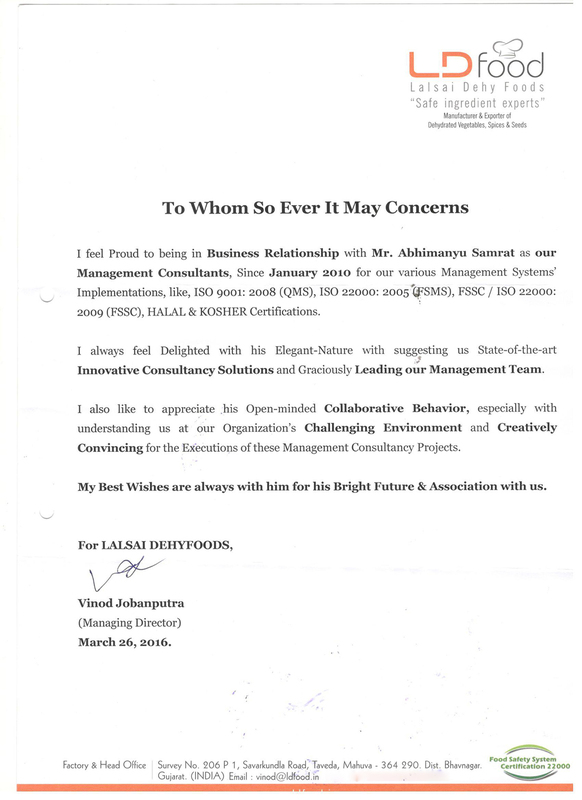 "Appreciation Letter provided by Lalsai Dehy Foods, I Feel Proud to being in Business Relationship with Mr. Abhimanyu Samrat as our Management Consultants, Since January 2010 for our various Management Systems’ Implementations, like, ISO 9001 : 2008 (QMS), ISO 22000 : 2005 (FSMS), FSSC / ISO 22000 : 2009 (FSSC), HALAL & KOSHER Certifications . 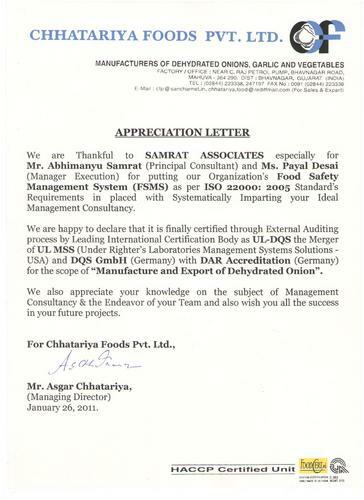 Appreciation Letter Provided By Chhatariya Foods Pvt. 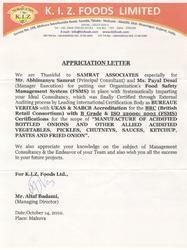 Ltd.
"Appreciation Letter provided by Chhatariya Foods Pvt. Ltd. for Implementation of Food Safety Management System (FSMS) ISO 22000: 2005 from UL-DQS the scope of " Manufacturing and Export of Dehydrated Onion. Company: Chhatariya Foods Pvt. 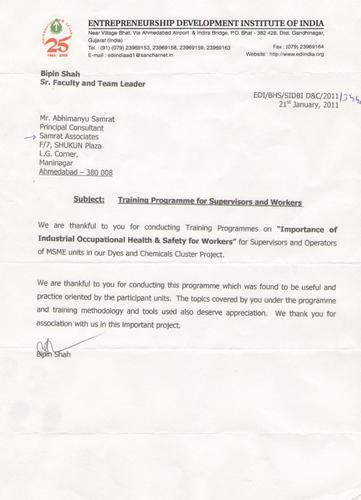 Ltd.
"Appreciation Letter provided by Entrepreneurship Development Institute of India (EDI), Gandhinagar for Imparting Training on "Importance of Industrial Occupational Health & Safety for Workers" for Supervisors and Operators of MSME units for Dye and Chemical Cluster Project." 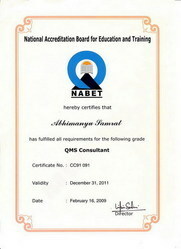 "Mr. ABHIMANYU SAMRAT (Managing Director) of SAMRAT ASSOCIATES is the Registered Consultant in NABET (National Accreditation Board for Education and Training) as QMS Consultant under NRBPT (National Registration Board for Personal and Training) as a Government of India affiliated organization named QCI (Quality Council of India)." Appreciation Letter Provided By K.I.Z Foods Ltd.
"Appreciation Letter provided by K.I.Z Foods Ltd. for Implementation of Food Safety Management System (FSMS) ISO 22000:2005 & BRC (British Retail Consortium) with B Grade for the scope of Manufacturing of Acidified Bottled Onion and Other Allied Acidified Vegetables, Pickels, Chutneys, Sauces, Ketchup, Pastes and Fried Onion." Title: Appreciation Letter provided by K.I.Z Foods Ltd.
"Appreciation Letter provided by Sarvottam Dairy, Bhavnagar for the Imparting Training on 5s - The World Class House Keeping Practice & Team Work on Production Floor." Mr. Harishankar Joshi - Bhavnagar , Gujarat , India. 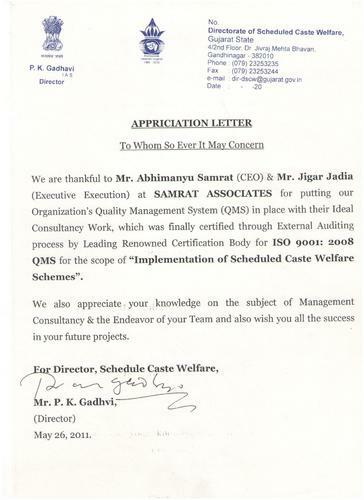 "Appreciation Letter provided by Directorate, Scheduled Caste Welfare for Implementation of Quality Management System as per ISO 9001: 2008 in Department of Gujarat Government. 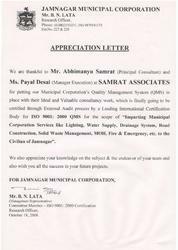 Appreciation letter was awarded in the presence of Government of Gujarat's Minister, Mr. Fakirbhai Vaghela"
"Appreciation Letter provided by Jamnagar Municipal Corporation for the Implementation of Quality Management System as per ISO 9001: 2000 in entire Municipal Corporation Departments." 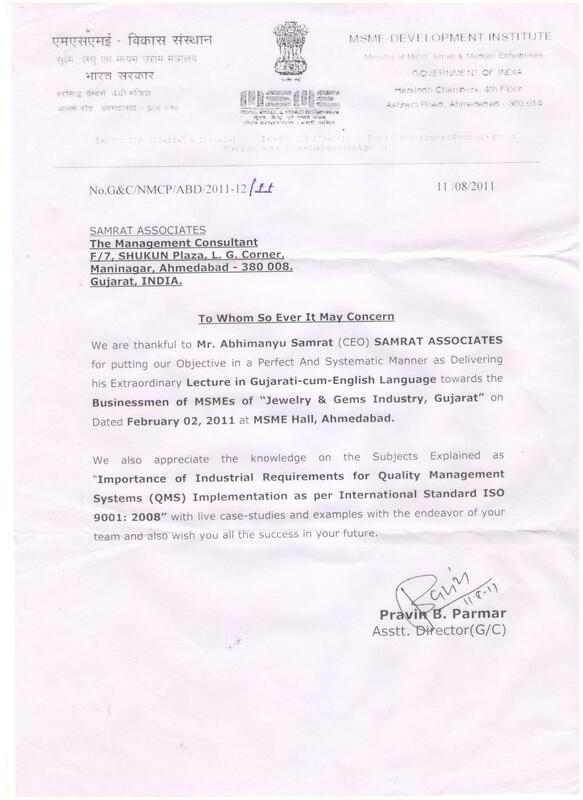 Appreciation Letter provided by MSME Development Institute, Ahmedabad for Imparting Lecture on "Importance of Industrial Requirement for Quality Managment System (QMS) Implementation as per International Standard ISO 9001:2008"
For Businessman of MSME's of Jewellery & Gems Industry, Gujarat. Ms. Payal Desai, our Manager Execution has become now a Registered Consultant for FSMS / HACCP (Food Safety Management System / Hazard Analysis and Critical Control Points) in National Level Organization named NBQP (National Board for Quality Promotion) formerly known as NABET (National Accreditation Board for Education & Training) as Division of QCI (Quality Council of India) Govt. of INDIA affiliated organization. Address : SAMRAT CORPORATE CONSULTANTS PVT. LTD.
Maninagar, Ahmedabad - 380 008.